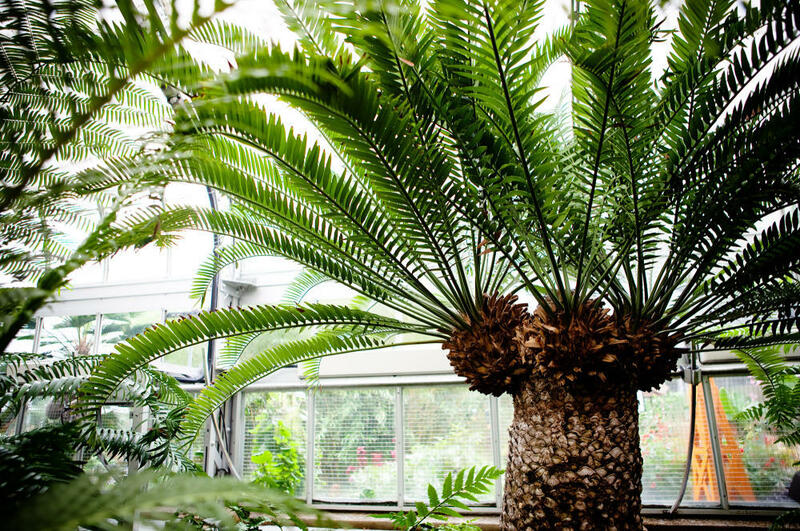 A cycad stands at the United States Botanic Garden in Washington, D.C., on Oct. 19. The 300 "modern" cycad species burst onto the scene about 12 million years ago, though the lineage of cycads extends back 300 million years. Sarah Mathews, a botanist at Harvard University, says a changing climate on the planet about 12 million years ago led to a burst of new plant species, including cacti and agave. A natal grass cycad grows in the greenhouse at the United States Botanic Garden. The sign says "The Garden Primeval — The First Land Plants." Right away we see something that looks like a fern growing out of the top of a palm trunk. But it's not a fern or a palm. In fact, it's more closely related to a pine tree. Cycads produce seeds but not flowers. They evolved along with dinosaurs, which presumably munched them for lunch. So they've earned the title "living fossil." But "that assumption began to break down as we began sequencing DNA," Mathews says. She and her colleagues — notably Nathalie Nagalingum from the Royal Botanic Gardens in Sydney — have used that DNA to reconstruct the "family tree" of cycads. They find that the "trunk" of the family tree may reach back 300 million years, but the "branches," today's 300 species, actually burst onto the scene about 12 million years ago. 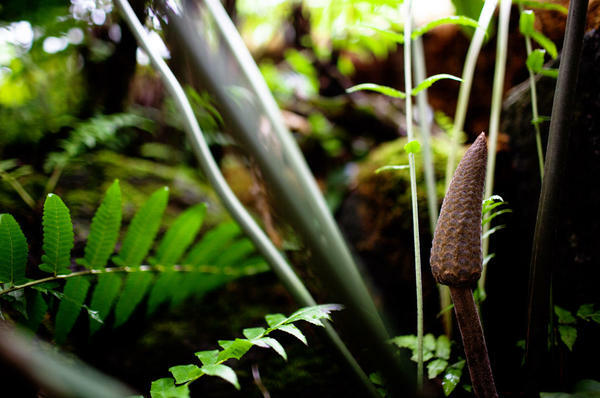 "And then it looks like around the world on multiple continents, cycads became more species-rich," Mathews says. What caused that sudden burst of new species? "That's the really fun puzzle, of course," she says. It's probably not a coincidence that other plants also put forth a burst of new species around that time, including cacti, ice plants and agave. Mathews suspects climate change played a role. "There was drying out and cooling going on, globally," she says. This research is part of a broader effort to understand how all plants — most notably flowering plants — evolved. That story is gradually taking shape as scientists study more and more of the DNA from plants. Of course, you might argue that this research has some broader philosophical repercussions as well. By finding that these species of cycads are just 12 million years old — and so were not survivors from the days of the dinosaurs — has Mathew's team demoted these species from their lofty status as living fossils? "I think that we've actually found some interesting patterns for people who didn't think much about cycads before," she says. What about people who think a lot about cycads? Bart Schutzman edits the Cycad Society's journal (global circulation: 500 copies). He's attracted to these plants because he feels a primal bond with this ancient species. And he says the news does not rock his world. Today's cycads still predate human species, and by a lot. "What's the difference between old, older and very old, and very, very old? I mean, they're all still very old," he says with a chuckle. As for the "living fossil" moniker? 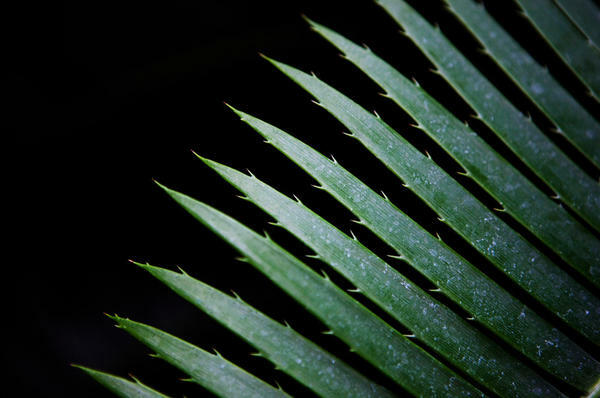 "It won't stop people from glamorizing the cycads as the living fossils because their lineage extends so far back," Schutzman says. So here's a little good news from Washington: A walk through the "Garden Primeval" greenhouse still offers a reasonable glimpse of foliage from the days of the dinosaurs, though the species themselves don't have quite the same bragging rights. The dinosaurs died out 65 million years ago, but there are still a few species thought to be left over from those days. Plants called cycads are among the rare living fossils - that is, species pretty much unchanged for over 300 million years. But a study in Science magazine suggests that title may not be deserved. NPR's Richard Harris reports. 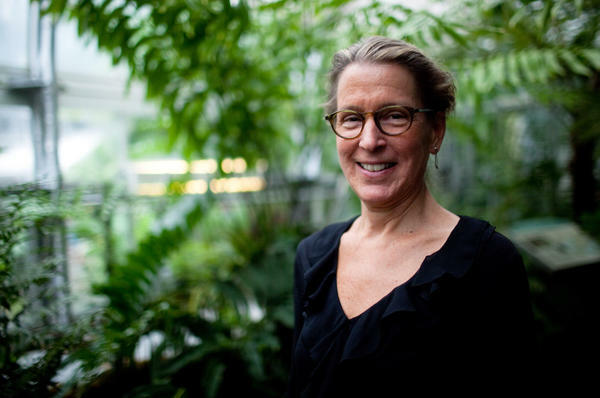 RICHARD HARRIS, BYLINE: There's no time machine in Washington, D.C., but Harvard botanist Sarah Mathews leads me to what's arguably the next best thing - a room made of glass in the U.S. Botanic Garden, just downhill from the U.S. Capitol. The sign says the first land plants, the garden primeval. And this is - you can certainly feel the humidity in here. Let's find a cycad. SARAH MATHEWS: There's one right behind you. HARRIS: We turn around and see something that looks like a fern growing out the top of a palm trunk. But it's not a fern or a palm. It's more closely related to a pine tree. Cycads produce seeds but not flowers. They evolved along with dinosaurs, which presumably munched them for lunch. So they've earned the title living fossil, species unchanged since the time of dinosaurs. Oops, says the new study. MATHEWS: That assumption began to break down as we began sequencing DNA. HARRIS: Mathews and her colleagues have just reconstructed the family tree of cycads. They find that the trunk of the family tree may reach back 300 million years, but the branches, today's 300 species, actually burst onto the scene about 12 million years ago. MATHEWS: And then it looks like around the world on multiple continents, cycad genera became more species-rich. HARRIS: So something apparently happened about a 12 million years ago, I guess, to all of the sudden these sort of few sleepy species found new opportunities to diversify. What do you think happened? MATHEWS: Well, that's the really fun puzzle, of course. HARRIS: It's probably not a coincidence that other plants also put forth a burst of new species around that time, including cacti, ice plants and agave. She suspects climate change played a role. MATHEWS: We do know that there was drying out and cooling going on at that point globally. HARRIS: So one of the implications of your study is the plant behind me is probably not in fact a living fossil. I wonder: Do you feel like you've demoted this poor plant? MATHEWS: Well, no. I think that we've actually found some interesting patterns that will be fascinating to people who didn't think much about cycads before. HARRIS: And what about people who think a lot about cycads? Bart Schutzman edits the Cycad Society's journal, global circulation 500. He's attracted to these plants because he feels a primal bond with this ancient species. And he says the news does not rock his world. Today's cycads still predate human species, and by a lot. BART SCHUTZMAN: What's the difference between old, older and very, very old, and very, very old? I mean, they're all still very old. HARRIS: As for the moniker, living fossil? SCHUTZMAN: It won't stop people from glamorizing the cycads as the living fossils because their lineage extends so far back. HARRIS: So a walk through the garden primeval greenhouse still offers a reasonable glimpse of foliage from the days of the dinosaurs, even though the species themselves don't quite have the same bragging rights. Richard Harris, NPR News. Transcript provided by NPR, Copyright NPR.